It Works Keto Energy can energize your body, focus your mind, and boost brain function to unlock your best self so you can live your best life. Once your It Works Keto Energy arrives, tear one of the packets and pour the delicious powder into your mouth. Instantly, your eyes will light up in delight from the smooth sweet flavor that dances in your mouth. Suddenly, moments later your mind starts to focus and you experience a mental and physical transformation that seems surreal but feels oh so good. Before you even realize it, your productivity is up, distractions are obliterated, fatigue has become fuel and you begin to unlock your best self. It Works Keto Energy is a one-of-kind energy experience that you owe it to yourself to experience. One of the beautiful things about the It Works Keto Energy is that dissolves instantly on the tongue and requires no water. That means you can take it with you everywhere and at anytime with a quick tear and pour you can be ready to unleash an energy flood to help carry through any sport, project or activity. Why You Should Try It Works Keto Energy? What is It Works! Keto Energy? What does “melt technology” mean? It Works! Keto Energy “melts,” or dissolves, right on your tongue for an instant energy boost on-the-go—no water needed!† As part of this technology, the Proprietary Energy Blend includes encapsulated caffeine and masked Vitamin B6 to help maintain the delicious sweet and tangy lemon lime flavor. How does It Works! Keto Energy help to fight fatigue and stress, while enhancing mood and mental focus? What does “encapsulated caffeine” mean? It Works! Keto Energy dissolves on your tongue instantly—no water needed! This is It Works! Keto Energy’s lemon lime “melt technology.” Caffeine can taste very bitter when poured directly onto the tongue, so we encapsulated it to have that sweet and tangy lemon lime flavor you will love! How much caffeine does It Works! Keto Energy contain? It Works! 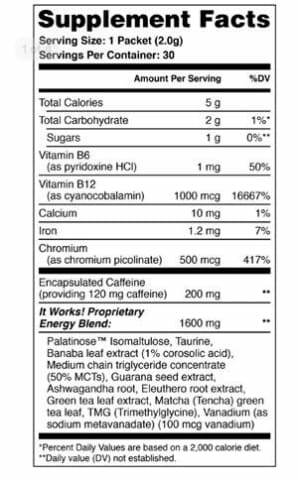 Keto Energy contains 120 mg of encapsulated caffeine per packet. This is the equivalent to the caffeine found in 1 1/3 cups of regular brewed coffee. How much sugar does It Works! Keto Energy contain? It Works! Keto Energy contains 1g of sugar from Palatinose™ (isomaltulose), a special carbohydrate that provides balanced energy. It provides a sweet flavor with no aftertaste, and, unlike sugar, which is quickly digested and absorbed by the body, Palatinose™ (isomaltulose) is digested slowly (4-5 times more slowly than regular sugar) so there’s no blood sugar spike that can trigger cravings. How does It Works! Keto Energy fit into my keto lifestyle? The caffeine in It Works! Keto Energy supports and increases your body’s ketone production.† With only 1g of sugar from Palatinose™ (isomaltulose) as a natural tasting sweetener, It Works! Keto Energy won’t cause a spike in insulin, which can shut down your body’s ketosis. Does It Works! Keto Energy include beta-hydroxybutyrate (BHB) salts? No, It Works! Keto Energy does not contain beta-hydroxybutyrate (BHB) salts. How do I use It Works! Keto Energy? It Works! Keto Energy dissolves instantly on the tongue – no water needed! Tear open the packet, pour the powder into your mouth and go! What does It Works! Keto Energy taste like? It Works! Keto Energy has a sweet and tangy lemon lime flavor. How is It Works! Keto Energy different from energy drinks? How many packets of It Works! Keto Energy can I take a day? Take 1 - 2 packets of It Works! Keto Energy per day. As both It Works! Keto Coffee™ and It Works! Keto Energy contain caffeine, we recommend that you do not take these two KetoWorks™ products at the exact same time. When should I use It Works! Keto Energy? How is It Works! Keto Energy different from It Works! Keto Go? It Works! Keto Go is a BHB-based product while It Works! Keto Energy is a caffeine-based product. It Works! Keto Go provides the body with exogenous ketones (supplemental ketones) to elevate ketones levels in the blood. It Works! Keto Energy helps enhance the production of endogenous ketones (those produced by the body), especially if on a ketogenic diet. Can you use It Works! Keto Energy and It Works! Keto Go together? Does It Works! Keto Energy contain gluten? It Works! Keto Energy is formulated with gluten-free ingredients. It is not currently tested for gluten that may or may not be introduced during the manufacturing process. Is It Works! Keto Energy vegan? No, it is not considered vegan. It is, however, soy-free, dairy-free and non-GMO. Can I take It Works! Keto Energy if I am pregnant? Can I give It Works! Keto Energy to my children? It Works! Keto Energy is recommended only for adults 18 years old or older. How should I use the KetoWorks™ products? It Works! Keto Coffee™ can be enjoyed hot or cold any time you need extra focus, a boost of energy, or to fight hunger!† Drink It Works! Keto Coffee™ first thing in the morning or anytime you’d reach for a cup of coffee for a quick pick-me-up that helps curb cravings.† As both It Works! Keto Coffee™ and It Works! Keto Energy contain caffeine, we recommend that you do not take these two KetoWorks™ products at the exact same time. Amp up your life with a touch of keto creaminess! It Works! Keto Creamer works as a creamer in hot and cold beverages, or as a creamer substitute in keto-friendly shakes and snacks. Need that boost for your brain and energy for your body in the midst of your hectic day? Find your focus wherever you go with It Works! Keto Energy. Drop a to-go packet into your pocket, purse, or gym bag for instant energy and focus when you need it most—no water needed!† As both It Works! Keto Coffee™ and It Works! Keto Energy contain caffeine, we recommend that you do not take these two KetoWorks™ products at the exact same time. There are three main food sources that your body extracts calories from: fat, carbohydrates, and proteins. Your body chooses glucose (from carbohydrates) as its primary energy source. When your body doesn’t have enough carbohydrates from food for your cells to burn for energy, it burns fat (which contains twice the calories as carbs and protein) instead. This process of burning fat for fuel is ketosis, and a by-product of this fat metabolism is ketones, a high-energy fuel source, particularly for your brain! and are a high-energy fuel source, particularly for your brain! A ketogenic diet is a low-carb, moderate-protein, high- fat diet. By restricting your intake of carbohydrates and proteins, the ketogenic diet kicks your body into ketosis, forcing it to use fat as its main energy source. Your body is designed to store fats in preparation for times of an “energy shortage” so that fat can be metabolized and burned for fuel. This is a natural process of your body that happens overnight when you’re sleeping, between meals, when you’re fasting, and even when you’re sick. A ketogenic diet uses this natural physiology to help you burn stored fat. How does It Works! Keto Coffee support a ketogenic diet? It Works! Keto Coffee provides you with protein in the form of collagen peptides and unique fatty acids from Grass-Fed Butter and Medium Chain Triglycerides (MCTs) to support your body’s ketone production and the process of ketosis. Do I have to follow a ketogenic diet to experience results with It Works! Keto Coffee? Is there anyone who should NOT follow a ketogenic diet? We suggest that you consult your physician if you are pregnant, nursing, taking medications, or have a medical condition. Can It Works! Keto Coffee be mixed as cold coffee? It Works! Keto Coffee can be enjoyed hot or cold. Mix one packet into 6-8 fluid ounces of hot or cold water. Have an It Works! Keto Coffee with your low-carb lunch. Want more? Add the plant-based protein of a Chocolate It Works! Shake and the nutrients of Greens Blend™ Chocolate for a satisfying, filling lunch that supports your body’s ketosis. Iaso Life Drops - Awesomeness in a bottle, change your body one drop at a time.